A laser chiller is the main component and the most important device used in managing laser temperature to insure high quality performance and long life of industrial lasers, medical lasers, military lasers and other laser systems. 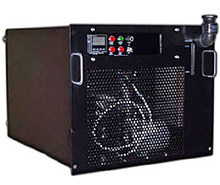 Laser chillers, Portable Chillers, Rack Mounted Chillers, Water Chillers and Heat Exchangers are completely self-contained devices, able to remove heat from laser heat-dissipating components. Industrial laser technology requires precision automated processing for high speed and high accuracy cutting, perforating, welding, laboratory environment, and other specialized processes. Medical laser technology requires a broad range of parameters for diagnostic and therapeutic medical applications. 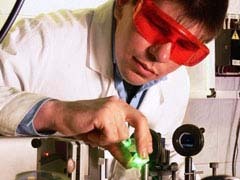 Medical and scientific lasers require reliable, precise temperature control for optimal beam quality of the laser. 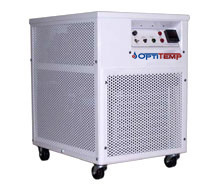 Opti Temp liquid cooling systems (chillers) are used to remove heat from today’s commercially available lasers and avoid overheating of critical components in industrial lasers and medical lasers. Although there are numerous heat-transfer fluids used as coolants for a wide variety of laser applications, including medical lasers, military lasers, and more. Water is by far the most common coolant used and if the system is properly designed, a recirculating water system (water chillers) provides an efficient, effective, and reliable means of cooling high-power laser systems. Since 1990 Opti Temp has proven to be a reliable supplier of Fluid Chillers and Heat Exchange equipment for a number of laser applications. Opti Temp will build a standard system for you or, if needed, design to customer requirements for size, portability, operating conditions, thermal load, and system footprint. We were able to take customer requirements, design the system, place a large cooling capability in a small package, and allow the Medical Laser OEM to offer the laser and cooling system in one attractive package. Designed for the industrial environment with a long service life in mind these chillers are recommended for all types of laser processes.